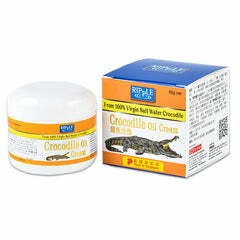 Ripple Crocodile Oil Moisturizing Lotion uses highly concentrated essence from the finest Saltwater Crocodile Oil. It contains rich Collagen proteins, amino acid, taurine, unsaturated fatty acids and minerals, a comprehensive balanced for deep skin nourishing and improve skin’s immunity. Crocodile Oil antioxidant repairs, hydrates and regulates metabolic activity of your skin cells leaving a unique long-lasting moisturizing effect. Long-term users will achieve a younger and healthier looking skin with a radiant glow. Effective remedy for common dry and sensitive skin conditions, relieve itching, eczema and other related skin problems. A natural skin emollient suitable for the young and old.